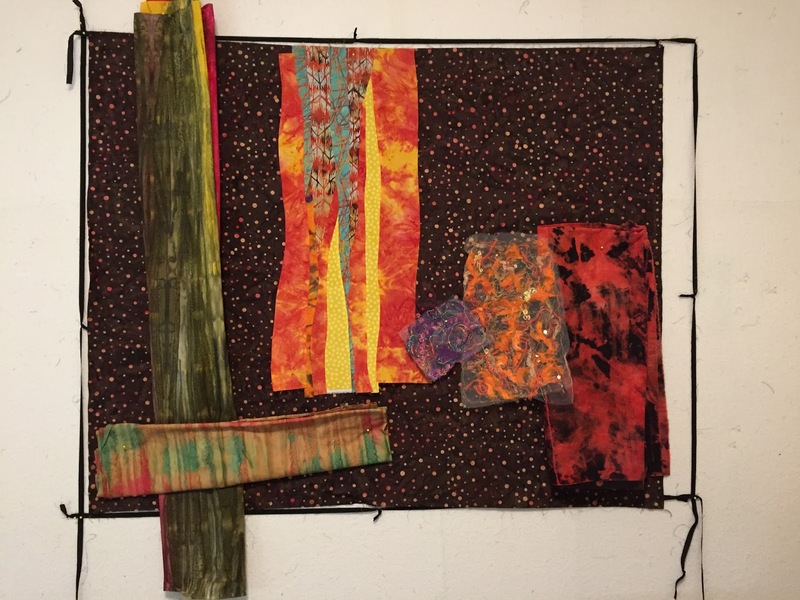 My local art quilt group put out a call for entries for an exhibit called "Heat Wave". 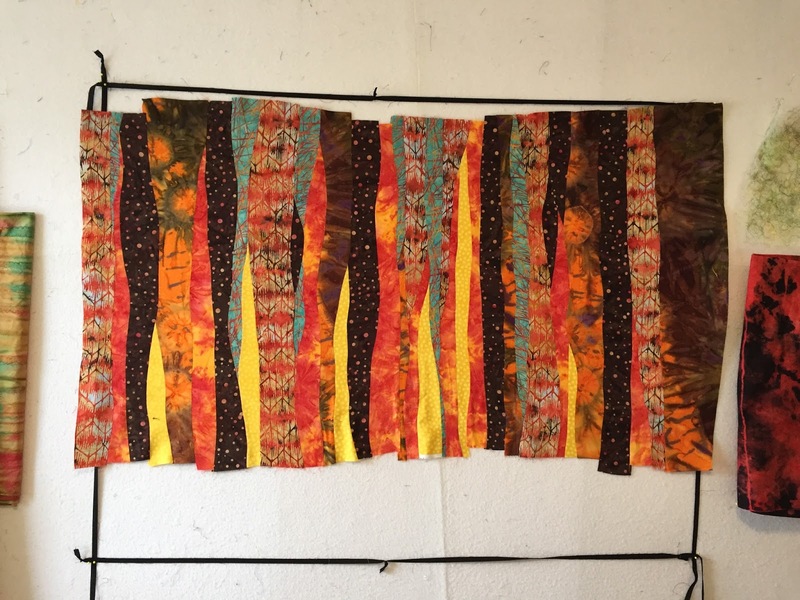 I immediately thought of the bright orange of the forest fires that we have been experiencing all over the Western United States over the last couple of years. I sketched up a few ideas, looked through my pictures, and scoured the internet for additional color inspiration. What I landed on was a plan to make a piece 3' x 4' with flames licking up from the bottom part of the quilt and pieces of burning embers floating up and through the trees. I collected a few fabrics that spoke to me. This time I really wanted to free form piece the background and layer on the units in a more intuitive way. 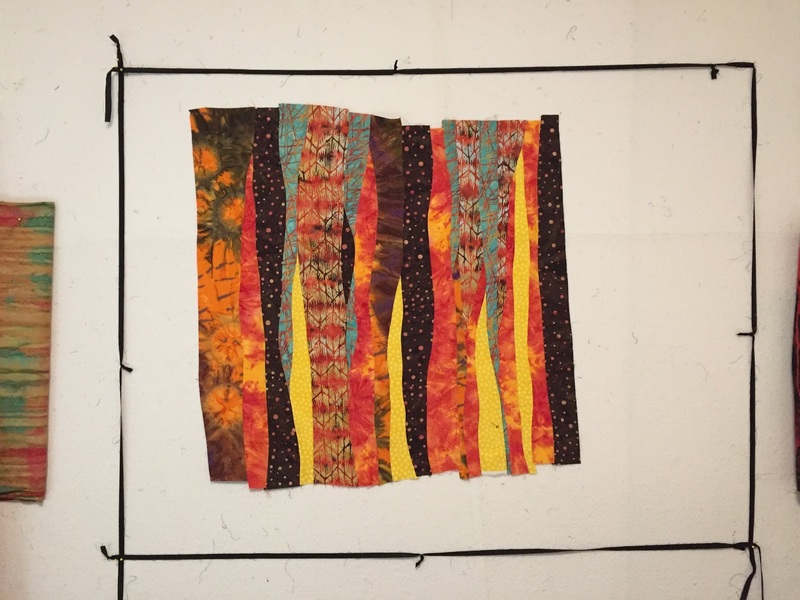 I free form cut curvy lines and started piecing. Here are some progress pictures. 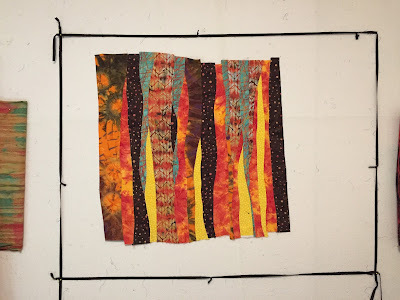 After putting the strip pieced units against the remaining fabrics, I opted to piece in some of the dark brown and continued to piece intuitively and free form cut the strips. Here is the upper background fully pieced. You can see that it mostly covers the top 2/3 of the area. The lower 1/3 was purposely reserved for a different technique and a different foreground look. I asked my husband to come in and tell me the first thing that came to mind when he looked at this background, and he said, " FIRE". Yippee! It has the feeling that I was going for. I hope it feels like FIRE to you too. Stay tuned for future progress. 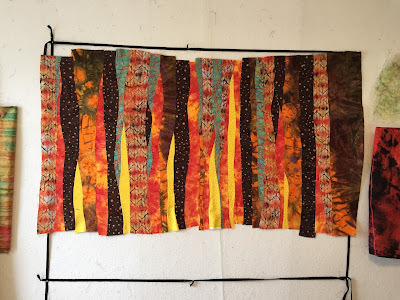 Your fabric choices really do resonate "fire!"